Brenna D’Amico is an American actress. She is known for her portrayal of Jane in the Disney Channel Original Movie Descendants. She also provided the voice of Jane in the animated short series Descendants: Wicked World. She stars on the Brat web series Overnights. 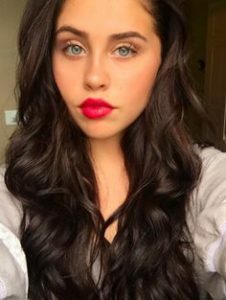 Born on September 28, 2000 in Chicago, Illinois, USA, to parents Shannon and Dave D’Amico, she has a sister named Aubree. She took her training at the LA Casting Director Workshops. She plays the guitar and piano and also active in YouTube. In August 2016, D’Amico started dating her Descendants co-star Cameron Boyce. *She was born on September 28, 2000 in Chicago, Illinois, United States. *She has one sister named Aubree. *She plays the piano and guitar. *Brenna has a height of 5 feet and 1 inches which is around 155 cm. *Follow her on Twitter, Facebook, YouTube and Instagram.